Everyone loves to know that they are doing a great job and at Delta Force Paintball, we’re no different! At every Delta Force Paintball centre in the country, after a successful day of paintball games, dozens of customers jump at the opportunity to thank and congratulate our managers and their staff. 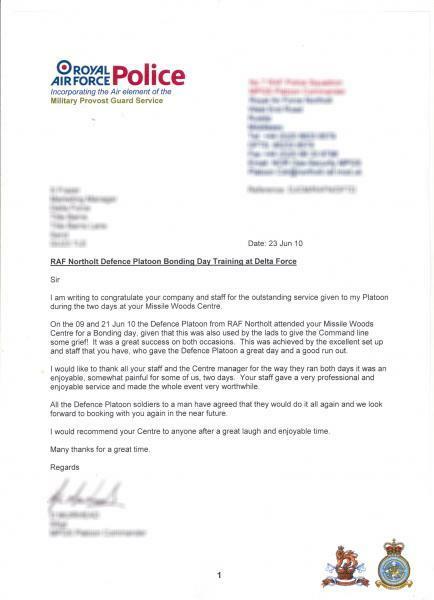 We regularly receive written feedback from some of our customers too, which can be found on our testimonials page. Most of the time we receive feedback from a birthday party to say they had the time of their lives, a corporate group congratulating us for hosting a successful company outing or from a Stag or Hen party thanking us for kicking off the pre-marital proceedings in fine style! Over the past month, a brilliant group from the Defence Platoon from RAF Northolt came down to our paintball centre in Maidenhead, Berkshire, for a team-building day not just once but twice! They had such a great day on both occasions that the group organiser sent us this letter to thank us for hosting their day out. Delta Force Paintball in Maidenhead, is a relatively new paintball centre as it opened in August 2009. Our Maidenhead venue introduced some incredible new game zones into the Delta Force repertoire, including ‘Zombies Crypt’, ‘Siege of Stalingrad’ and ‘The Black Pearl’. Since then, our dedicated construction team have been hard at work bringing these amazing new game zones to every Delta Force Paintball centre across the country, as well as improving all our classic game zones that helped earn Delta Force the reputation as the best provider of paintball games in the UK. If you would like to play paintball with Delta Force why not give our booking office a call on 0203 869 9301 and see what kind of exciting paintball day out we can offer you.